The Met Breuer. Image courtesy of the Metropolitan Museum. 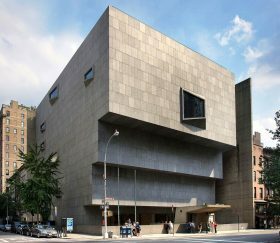 It was announced Friday that the Met Museum would lease the Breuer building to the Frick, the New York Times reports. 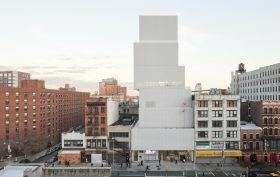 According to an agreement between the two venerable art institutions, the Metropolitan Museum of Art will likely sign the Met Breuer on Madison Avenue over to the Frick Collection beginning in 2020. 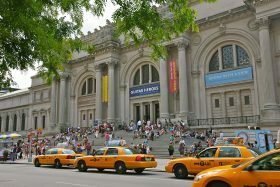 Doing so would allow the in-debt Met to free itself of the last three years of an eight-year lease and an $18 million annual expense and enable it to put funds toward improving the modern and contemporary galleries at its Fifth Avenue flagship. 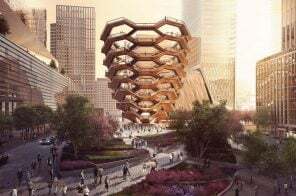 Likewise, the Frick would have a suitable temporary home while the Gilded Age mansion that it inhabits is being renovated. Following two years of renovations, the Metropolitan Museum of Art reopened its impressive music collection, which includes roughly 5,000 instruments dating from about 300 B.C. to the present, grouping them by period and type, rather than culture by which they were created. The redesign of the exhibit, called The Art of Music, places “Fanfare” as the first gallery. 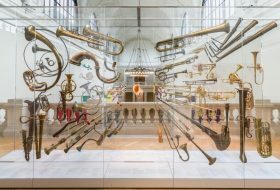 Drawing visitors into the instrument gallery, Fanfare features 74 brass instruments “spanning two millennia and five continents.” It includes sacred conches, animal horns, a vuvuzela and more. And now, for the first time, the instruments can be heard through dynamic kiosks at the museum, or online. 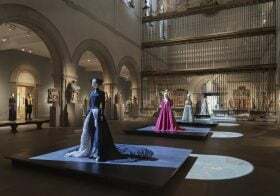 On Monday night, Rihanna, Madonna and all of the celebrity A-listers posed on the Met Gala’s red carpet to show off their over-the-top interpretations of the Metropolitan Museum’s 2018 Costume Institute exhibit “Heavenly Bodies: Fashion and the Catholic Imagination.” This year’s exhibit focuses on the dialogue between fashion and medieval art, displaying Papal robes and accessories from the Sistine Chapel, many of which have never been seen outside The Vatican. 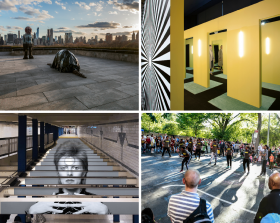 To house it all, the Met tapped architecture firm Diller Scofidio + Renfo (DS+R) to design the show, and ArchDaily has uncovered this gorgeous photo set showing their work. 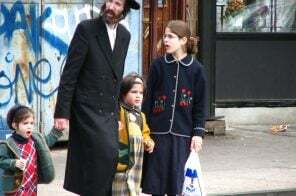 At the beginning of the year, the Met announced that it would begin charging non-New Yorkers (i.e. those without a state ID) $25 for admission, waiving its pay-what-you-wish policy that had been in effect since 1970. And as of today, that policy is officially being implemented through signs at all entrances, 14 new kiosks in the Great Hall, roaming museum staff with iPads, and a brochure that explains the new fee system, reports the Times. 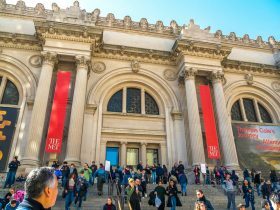 The Times may have recently questioned whether or not the Metropolitan Museum of Art is “a great institution in decline” (referring to its $40 million deficit and decision to put on hold its $600 million expansion), but the paper is much more positive when reporting on the Met’s new Open Access policy. 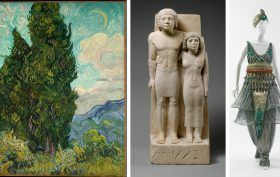 This allows free and unrestricted use of 375,000 high-resolution images of artworks in their collection, ranging from paintings by Van Gogh, El Greco and DeGas to ancient Egyptian relics to classical furniture and clothing. If you’ve ever visited The Metropolitan Museum of Art and watched an artist working at a canvas or sculpting amongst the museum’s larger than life pieces, then you’ve seen the Copyist Program in action. 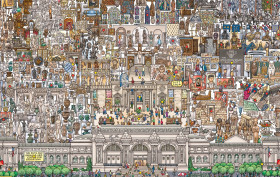 Founded in 1872, two years after The Met first opened, the program has provided countless artists the opportunity to copy the great works that fill the museum’s numerous galleries. 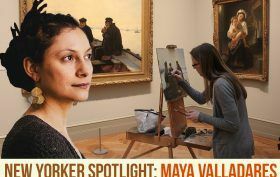 The Copyist Program is overseen by The Met’s Department of Education, and Maya Valladares, an artist focusing on textiles, serves as the its Assistant Educator for Public Programs and Creative Practice. Her role requires her to create holistic experiences through the museum’s public programming, and through the Copyist Program, she works to enhance the experience of copying for the students and cohorts that come through the museum’s doors. 6sqft recently spoke with Maya, who shared details about the program’s rich history, what copying offers artists, and what it’s like to duplicate the works of a world-class museum.